Vitamin D Fails In Major Woman’s Study: Findings Represent Results Of First Large Scale Trials of Vitamin D and Calcium For Prevention Of Bone Loss And Cancer. The Women’s Health Initiative is a huge long-running study that has contributed a lot of useful information to the world of medicine and prevention. 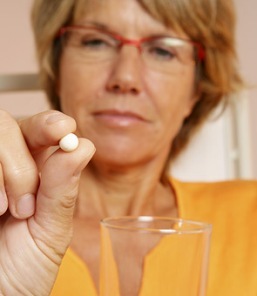 Over 15,000 women were analyzed after taking Vitamin D and Calcium supplements. A modest reduction in hip fracture was seen, suggesting that this routine has some benefit in preventing osteoporosis or softening of the bones that happens with aging and hormone deficiency. Osteoporosis remains one of the major causes of death, disability and comes at a huge cost to the health care system. The study also looked at colon cancer and found no benefit to Vitamin D in preventing colon cancer at all. These findings represent the results of one of the first large scale trials of Vitamin D and Calcium for the prevention of bone loss and cancer. 1) The study used 400IU of D3 and 1 gram of the Calcium carbonate, the worst choice for calcium supplementation. We have seen this before. If you want to prove something does not work, make sure you use inadequate doses, the wrong supplement and use it for a time frame that may not show benefit. 3) The colon cancer controversy is interesting and this was a big study but once again I think the dosages of D need to be in the 2000 to 5000 IU range to show benefit. Everyone is concerned about D toxicity but I think this is also much ado about nothing since it is extremely rare and D deficiency is far more common. 4) Also lacking in the study were actual measured levels of D in the bloodstream. This would have been expensive but much more useful in terms of determining the right level of D and the same for calcium. At least pick a supplement that is well absorbed. 5) Notice no one said anything about Vitamin A causing cancer in this huge study either!!!! Overall I find the study to be of limited value because it tells us what we already know. If you use low doses of the wrong supplements you will not get much return! https://realpointmedia.kinsta.com/thelongevityedge/wp-content/uploads/sites/6/2017/01/longevityedge.jpg 0 0 Dr. Dave https://realpointmedia.kinsta.com/thelongevityedge/wp-content/uploads/sites/6/2017/01/longevityedge.jpg Dr. Dave2010-07-13 20:50:372010-07-13 20:50:37Vitamin D Fails In Major Woman’s Study: Findings Represent Results Of First Large Scale Trials of Vitamin D and Calcium For Prevention Of Bone Loss And Cancer.